I am a slow, patient, pragmatic person. I make do research, make plans, and will wait to proceed until the time is right. Proposing to my wife, Meagan, was no exception. Before I started scheming, I took her out to a handful of jewelry stores to get a feel for her tastes and preferences. We ended up at one of the larger stores in our area, and at this particular store, the stones can be selected and then mounted onto the band of choice. Meagan likes to make all aspects of her style uniquely uncommon, and she gushed over a beautiful emerald cut diamond, which would go perfectly on a cathedral mount and simple yellow gold band. With that knowledge, I now had some parameters to work with. I saved and scrimped for almost a full year before proposing. I learned all about the 4 C's of diamonds, researched the various scales of quality, investigated the brands, and weighed my options. 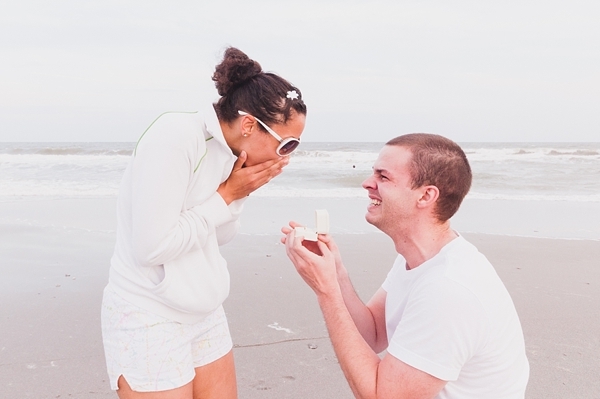 I also came up with lots of clever and cheesy ways to stave off the "Oh my gosh, when is he going to finally propose?" commentary. I found the perfect stone, perfect setting, and a week after starting my quest (and about 6 months of research), it was sized, polished, and in a box hidden in my sock drawer. I pretty much cried whenever I went to put my socks on or caught sight of the box. I could barely get out a word when I asked her father and mother for permission. From that point on, I was pretty much a blubbering baby until well after the wedding. Two years on, I'll admit I still am. Two weeks after I picked up the ring, we were in Myrtle Beach visiting my grandparents. Meagan was having a bad day, but I had decided that it was time. I couldn't wait any more. Somehow I persuaded her to walk a few blocks down to the beach with me. She wasn't really happy about it but still obliged. Once on the beach, I convinced her that I was going to shoot a panorama of the sunset (being a photographer has its perks), and I set up two cameras. I told her to run in circles around the cameras while I set the exposure. Again, she obliged and didn't think anything beyond that since she helps me with photo shoots often. Little did she know that the cameras were already set. I just needed time to get the ring out. She made a few revolutions around the tripods. One was recording video and the other was shooting stills every other second. I knelt down and fumbled the ring box out of my back pocket. She had no idea. No idea. For the first 10 seconds (felt like forever) she just stared down at me while I was on one knee with arm outstretched. Half crying, half awkwardly laughing, I managed to say something that may have resembled "Will you marry me?". People were starting to stop and gawk at us. My weird scrunched up crying face didn't help. "Say something!" I thought. Finally an "Oh my god!" came forth. "Yes!" she said. It was an amazing few moments. I felt like I was on top of the world. But holy cow, we've got to plan a wedding now. Chris Malpass is a portrait, wedding, and fashion photographer based in Newport News where he resides with his wonderful wife and their menagerie of fur-babies. As a Yorktown native, Chris has lived in Hampton Roads all of his life. During his teenage years, Chris started his creative journey and has since pursued unique adventures and experiences that shape his approach to life and photography. On a lazy Sunday afternoon, you may find him storyboarding his next fashion shoot, trying to find a documentary on Netflix he hasn't seen yet, or thrifting with his wife. Chris loves to revisit the source of his early inspiration at Yorktown Battlefields and can regularly be found exploring ethnic restaurants in the region. All photos by Chris Malpass.